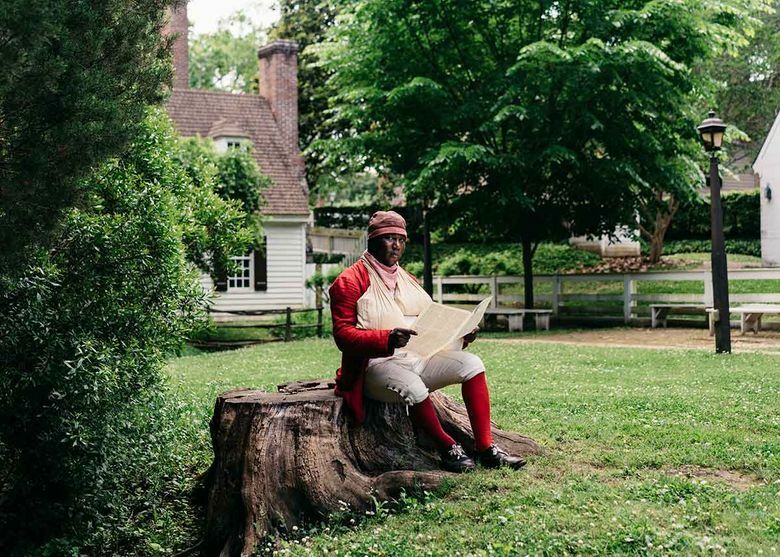 Jeremy Morris, 30, plays the roles of 18th-century black men at Colonial Williamsburg in Williamsburg, Virginia. Q: What is your role at this living-history museum? A: I portray free and enslaved blacks. We say “enslaved” to give individuals their full humanity, to be clear that this is a condition placed on a person rather than defining who they are. I tell their stories and provide context for the institution of slavery. I give talks at designated times and people also engage me in conversation when I’m walking around. Sometimes a crowd gathers to listen. Q: One person you portray is Jack Booker. Who was he? A: Jack Booker shows up on the inventory of Joseph Scrivener, a merchant who died in 1772. Then Alexander Purdie, the postmaster at the time, bought him. From that, I gathered Booker delivered packages and was literate. Q: Is it difficult keeping the different people you play separate and distinct? A: No, because of the dearth of information available, which is a double-edged sword. I usually only know the man’s name, his age at the time he worked here and his job. From an artistic standpoint, that’s exciting because we’re able to fill in the blanks in his history creatively. But it’s also disheartening that we know so little about these men because of the way society viewed them. A: I’ve been acting for about 10 years in regional theater. Recently I acted in “The Parchman Hour” in Norfolk and “Blues for Mister Charlie” at the University of Richmond. I also wrote and starred in a play, “The Top of Bravery,” produced last year. I tied for the best actor award from the Richmond Theater Critics Circle for my performance and the production got an award for outstanding original work. Q: Did you know you wanted to act at an early age? A: I wanted to be a poet and set the world on fire with my writing. At my high school, the Appomattox Regional Governor’s School for the Arts and Technology, I tried acting only because it was something I hadn’t done. I was cast in two one-act plays in a play festival there and really liked it. I was still into poetry in community college, but I didn’t find many poetry events, so I looked for something else related to the arts. I answered a casting call, got a part in another play, and left school and switched paths. Q: How do visitors react to what you do? A: Some people try to understand what it was like for people like Booker, who had no standing in the world. They ask what it’s like to listen to the rhetoric of the day, before the Revolutionary War, about freedom, justice and equality when you’re on someone’s inventory. When I say there were more free and enslaved blacks than whites in Williamsburg in the 1800s, it goes against what some people have been taught and can shake their foundation. One man asked why I don’t talk about the good things in the past and I told him if I don’t speak the truth, I’m not telling him history. Q:What’s it like to act in these roles? A: I feel a great responsibility. Back then I wouldn’t have been able to speak like I do at work, or it would put people in danger. We’ve made progress, but we haven’t yet fully achieved the idea of America. 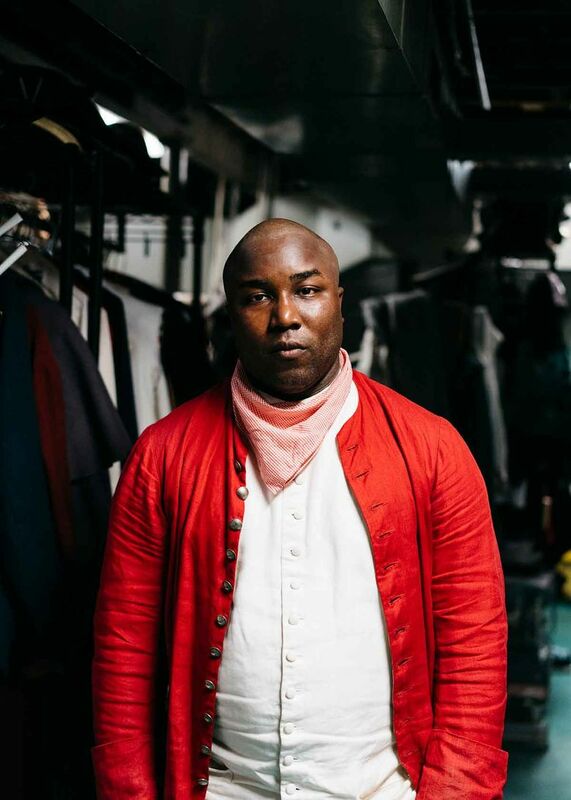 Q: Is acting in the Broadway play “Hamilton” on your bucket list? A: The touring company has my head shot and video audition.